2014 Jeep Grand Cherokee Pros and Cons: Why (Not) This Car? Need (or at least want) a midsize SUV with off-road potential, but concerned about fuel efficiency? 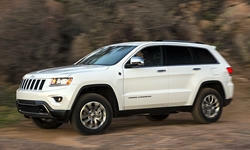 Well, for 2014 the Jeep Grand Cherokee is available with a diesel engine. Opt for all-wheel-drive, and a two-speed transfer case (all but required for serious off-roading) is part of the bargain. The Jeep diesel's closest competitor, the Volkswagen Touareg TDI, is offered with a two-speed transfer case in Europe but is no longer available with one here. I tried to test drive a Touareg TDI for comparison purposes, but the dealer didn't have one. In fact, they had no Touaregs at all. They don't get many, and the few they got were gone. So I'll be relying on my impressions from a test drive of the gas V6 from a few years ago, plus my more recent tests of the Audi Q5 TDI and Q7 TDI, which have the same diesel engine as the Touareg TDI. Clean, understated styling inside the Grand Cherokee as well. 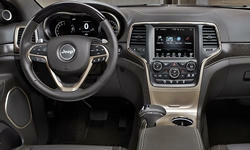 Why the 2014 Jeep Grand Cherokee? Concerned about the ability of a 240-horsepower turbocharged 3.0-liter diesel engine to motivate a 5,275-pound SUV? You needn't be. As with the latest diesels of similar size and power from VW and Mercedes, there's a touch of lag when you initially depress the throttle, after which the engine (initially developed for European-market Cadillacs) pulls and pulls. Credit the combination of 420 lb-ft of torque at 2,000 rpm (a touch more than the VW/Audi TDI) and an also-new-for-2014 eight-speed automatic transmission. This transmission, the same unit used in many luxury cars, has an ideal gear ratio for just about any situation, and is quite good at automatically selecting this ratio quickly and smoothly. Highway passing with the diesel isn't quite as quick as with a gas V6 engine. And if you're seeking an ultra-quick Jeep, then the 470-horsepower SRT (now also paired with the eight-speed automatic) is the one to get. But in typical around-town driving the diesel pulls like a gas V8. While idling and at low speeds, the Jeep's diesel engine (also available in the Ram pickup) isn't as quiet as that in the Touareg (which leads the industry, including the torquier diesels from Mercedes, in this regard). But hardly anyone is likely to find its mild clatter objectionable. If anything, it's an interesting break from the norm. Pretend you're driving a big rig! But I didn't lead with "powertrain performance" based on the merits of the engine and transmission, as proficient as they are. Rather, the tested Grand Cherokee was fitted with the full array of available off-roading hardware, including a height-adjustable air suspension (capabling of providing an extra four inches of ground clearance at low speeds, for a total of nearly a foot), limited-slip rear differential (capable of separately locking each rear axle), five-mode traction control, crawl control, and skid plates. I wasn't able to evalute this industry-leading system off the road, but have no doubt as to its capabilities. Among SUVs somewhat close in size and price, only the $62,000 Land Rover LR4 packs a similar arsenal. With the towing package (included in the off-road package), the Grand Cherokee diesel is rated to tow 7,200 lbs. (Add 200 with rear-wheel-drive.) The Touareg and LR4 are rated to tow another quarter-ton. You won't often see fuel economy among the reasons to buy a Jeep, and I wouldn't have it here without caveats in tow. EPA ratings of 21 mpg city, 28 mpg highway aren't anything special for a five-passenger vehicle. But they are impressive for a true midsize SUV, especially one that weighs over 5,000 lbs. The gas V6 is rated 17/24 (four mpg lower on each), the similarly torquey V8 14/20. The Touareg TDI manages about the same, 20/29. The gas-powered LR4, even with a supercharged V6 taking the place of a V8: 14/19. In suburban driving the trip computer typically reported averages from 18 to 21, similar to the even larger and heavier Mercedes-Benz GL350. On one run home from my son's school I managed just over 29, but this involved a lot of luck with traffic lights and a very light foot on the throttle. During a small amount of highway driving the trip computer averages were inexplicably no better than in town. Maybe the weather conditions weren't favorable, as I've never fallen so short of an EPA rating before. Worth noting: diesel tends to cost at least as much as premium unleaded gas, and usually costs significantly more. So while mpg improves, fuel cost per mile doesn't improve as much, sometimes not nearly as much. Styling cleaner than most these days, yet full of character. Not all of the switches have a quality feel, but the controls are among the easiest to use. The current Jeep Grand Cherokee began development with the latest Mercedes-Benz M-Class. Though the two development teams went their separate ways when DaimlerChrysler split apart, the Grand Cherokee and M-Class remain very close in key dimensions. Of the two, though, the Jeep is the more attractive vehicle, with cleaner yet also more rugged lines and a more artfully sculpted front end. In fact, it's hard to find a vehicle that better combines upscale and rugged styling. Certainly not the boxy LR4. Perhaps the Range Rover. The Touareg, despite its off-road capabilities, looks more like a tall car than a brawny SUV. The Toyota 4Runner goes too far in the other direction, all beast, no beauty. Everyone has been fumbling around with innovative control interfaces. Among touchscreen-based systems, Chrysler's--added to the Grand Cherokee for 2014--is by far the easiest to use, with large, well-spaced, logically organized buttons and quick responses. Redundant conventional controls include three large knobs, which is three more than you'll find in many of the latest systems. As in other recent Chrysler products, the instruments flank a somewhat reconfigurable LCD with a couple of analog gauges. These instruments appear more impressive in a $20,000 Dodge than in a nearly $50,000 Jeep. Functionally, though, they perform well. The tested Jeep Grand Cherokee's sticker initially shocked me. $48,785 for a Jeep?! But this does include $1,000 for off-road hardware the Touareg doesn't offer along with a $3,000 Luxury Group (auto-dimming Xenon headlamps, rain-sensing wipers, heated-and-cooled soft leather seats, panoramic sunroof). Equip a Volkswagen Touareg similarly, and it lists for $14,285 more despitehaving about $2,000 less content. If a $48,000 Jeep is shocking, then what's a $61,770 VW? For about the same price as the VW you can get an off-road-ready, three-row Land Rover LR4, and for the a few thousand dollars more you can get a Mercedes-Benz ML350 BlueTEC. The Jeep costs far less than any of the other three. Not that you can't also spend much more on the Jeep. The Limited is the lowest of the three trim levels available with the diesel engine. A Grand Cherokee Overland with the diesel lists for $53,485, and Grand Cherokee Summit with the diesel lists for $56,990. "With the diesel" is critical, and not just because we're reviewing the compression ignition engine here. Jeep charges an extra $4,500 for this engine, a hefty premium. VW charges $3,500 for its oil burner, while Mercedes charges only $1,500. Though the Jeep's bottom-line price is competitive, and then some, the line-item price for the diesel engine option suggests that they're not actually trying to sell many. If Mercedes-Benz can offer a diesel for only $1,500 more, then Jeep (which won't be making them in as high a volume) shouldn't have to charge more than twice that amount. Why Not the 2014 Jeep Grand Cherokee? The current generation Grand Cherokee had a fairly rough first year, and the 2014 refresh also appears to have added some glitches. If the past is any guide, though these problems should be ironed out soon, if they haven't been already. One notable problem area: the air suspension that adds to the Jeep's off-road capability can be a source of expensive (once out of warranty) repairs. In traffic the Jeep Grand Cherokee provides the outward visibility that won people over to SUVs in the first place. The pillars flanking the windshield are a little thick, but you sit higher than in most other vehicles. Visibility to the rear is limited by the height of the rear window's lower edge, but this is also typical of SUVs. Not quite as typical: nose into a parking space and it's nerve-wrackingly difficult to tell where the front corners are. Forward obstacle detection or around-view cameras would help, but unlike in the European competition neither is available. Updated face for 2014, still clearly a Jeep. Much roomier back seat than pre-2011 Grand Cherokees. Handling is much the same: quite good for a true SUV, with intuitive steering, good balance, and far less lean than in a Land Rover LR4 or Toyota 4Runner, but too much height and weight to be car-like. The all-terrain 18-inch tires don't provide much grip on pavement. Grippier, sharper-handling (but much less off-road-worthy) 265/50R20 tires are a $1,195 option. No such excuses need be made for noise levels. They're luxury car low. Materials and workmanship are generally at least as good as can be expected for the price. Going down the road, the Jeep feels rock solid and (aside from the ride issues that commonly affect heavy SUVs) thoroughly refined. Its character is much closer to that of the big buck Europeans than that of past Jeeps. Its common genesis with the Mercedes-Benz M-Class comes through. Within this whole, too many of the switches seem cheap. I had hoped that the revisions for 2014 would fix this, but they haven't, at least not enough. The metal-look plastic trim that covers the center console looks and feels good as such trim goes, but doesn't quite seem suitable for a nearly $50,000 vehicle. The Overland and Summit substitute real wood. The moderately firm front seats are comfortable, but could use a little more contour. Those in the high-performance Grand Cherokee SRT are much more heavily bolstered. Perhaps these should be offered as an option in other Grand Cherokees. The Touareg's front seat is mushier--odd for a VW--and not as supportive. Moving to the back seat, the Grand Cherokee's last complete redesign, for the 2011 model year, added a couple of badly needed inches to legroom. With this improvement the Grand Cherokee outstretches the VW by a couple of inches. The ML-Class has a similarly roomy rear seat, though, while the LR4 offers a third row. The Jeep's rear seat is comfortably high off the floor, not a given these days. Cargo volume--36.3 cubic feet with the second row up, 68.3 with it folded--is similarly competitive. The Touareg and M-Class can hold a couple more cubes, but this isn't a meaningful difference. Compare the Jeep to mainstream compact crossovers like the Honda CR-V and Toyota RAV4, though, and it becomes clear that true SUV underpinnings aren't good for space efficiency. These car-based crossovers are much smaller than the Jeep on the outside, yet have a little more room for cargo on the inside. With the diesel engine, the Jeep Grand Cherokee offers a combination of fuel efficiency and off-road capability you can't get from anyone else in North America. The exterior styling manages to combine ruggedness and sophistication, while solidity and refinement approach those of much more expensive European competitors. Ride and handling are short of car-like, but they come closer than in the past, and most true SUVs perform worse. But what if you're never going to go off-road and don't need to tow more than 5,000 pounds? Then the Grand Cherokee becomes harder to justify. Not against European competitors; they do little far better while costing far more. But an Acura MDX is quicker, handles much more athletically on-road, manages similar fuel efficiency (EPA 18/27, but at least as efficient as the Jeep diesel in my real-world driving), can seat two more people in a pinch, and can hold 22 cubic feet more of your stuff. Alas, it's also a few thousand dollars more expensive, even with the over-priced diesel on the configured Jeep. So, even against a Japanese competitor a nearly $50,000 Jeep can come across as a value play. Remove its cover, and the diesel engine remains buried under its plumbing. Not quite as much cargo volume as a Honda CR-V or RAV4. But competitive with other upscale SUVs. Jeep provided an insured vehicle for a week with a tank of diesel. Dan Kelley of Suburban VW in Farmington Hills, MI, provided a Touareg V6 for a test drive. Dan can be reached at 248-741-7903. 2014 Jeep Grand Cherokee pros and cons, according to Michael Karesh: the best reasons for buying (or not buying) the 2014 Jeep Grand Cherokee. Join TrueDelta to post your own impressions.